Do you check/flush the hydrant? This entry was posted in Driver, Hydrant/Water Supply by countyfiretactics. Bookmark the permalink. We do not currently, but it is good practice to test a hydrant while in level 1 staging to insure proper function. If the hydrant is not working effectivly then you have stopped the first domino from falling. Anytime a Fire Company is staged at a hydrant and or sitting idle, they should flush and insure proper operation. With the hydrants getting older, it is more common for failure. Recently, while buffing a fire, witnessed a hydrant not work in front of an occupied apartment building fire. The Engine Driver went to flush before hooking up and found hydrant to be inoperable. He rapidly reversed down the street to the next available hydrant. 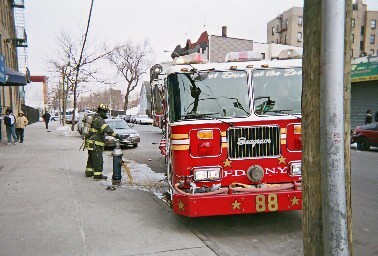 When stopping at a hydrant for a forward lay, the company should pause until the hydrant firefighter confirms water. Why would you not check/flush a hydrant while standing fast? Standing fast means to be 100% prepared. Doesn’t take much time to flush the hydrant while staging. Also, during hydrant checks it is important to pay attention to hydrant lay out and mains so that you know if the second hydrant may be on a bigger main even though it is further away.